Very nice looking gondola, Martin. Got to dig through the project boxes a bit and re-org the debris - a little decision making on some getting diverted to the sell off bins and then pulling the next project. Nice to see the one pile slowly shrinking; what to do with the pile of completed cars! Off to the sell off bins, I guess. 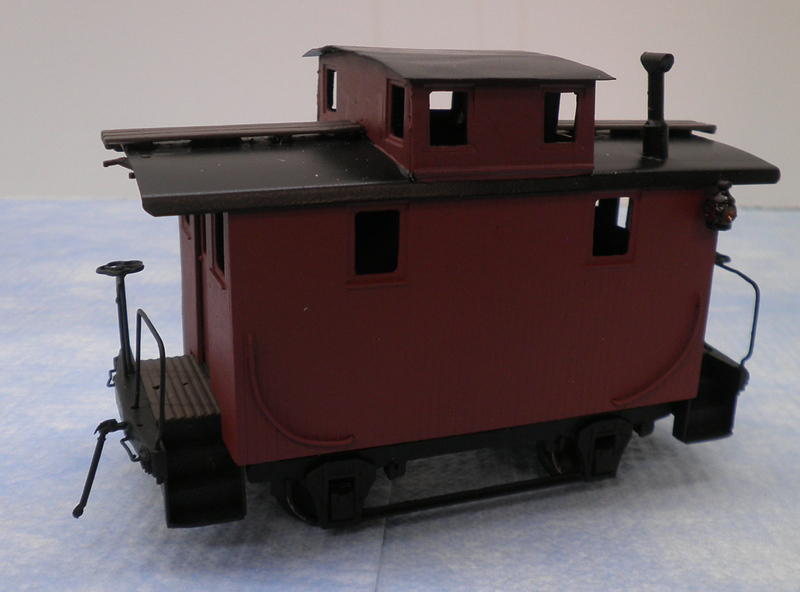 Next up out of the crates of project boxes.........a Thomas Bobber caboose! Looks like most of it is there with most of a prior paint job or 3 removed. 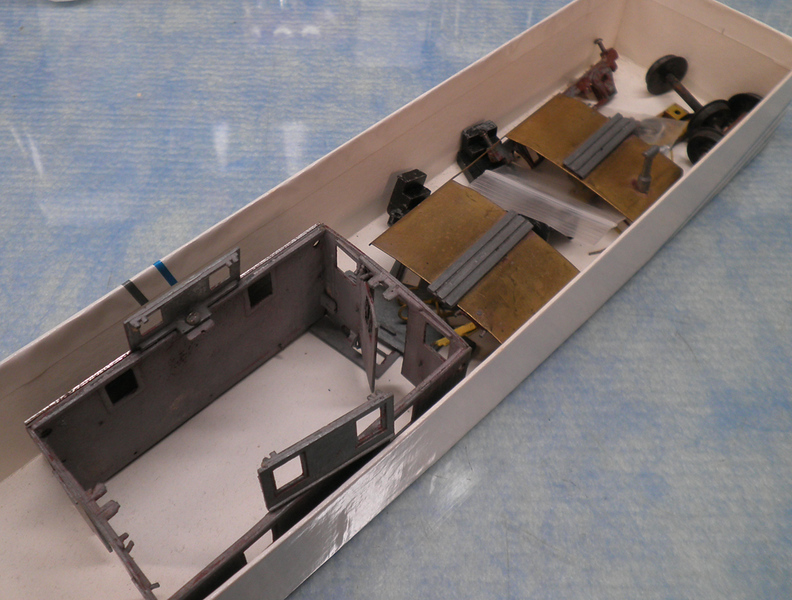 Brass for the cupola roof is missing, but that's not a problem to replace, Brakewheels and brake cylinder are also absent. We'll have to see what can be made of this and how it all goes back together. Making a bit of headway with the bobber...added a bit of underbody to the sheet metal floor and some bits to the ends. 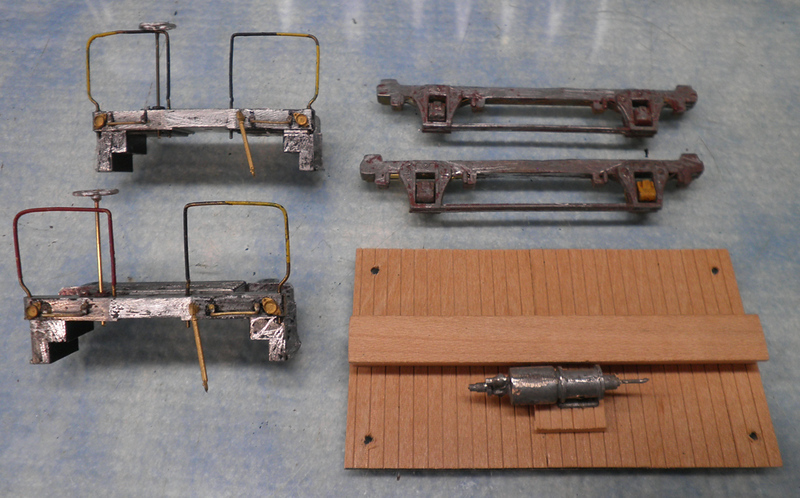 Sideframes reassembled with all their bits in place and all a bit cleaned up now, too. Got the cupola assembled and mounted to the main roof; there were slots for screwing the cupola to the body shell, but I've just mounted in place with JB Weld and made it into a single integral unit that's much more stable. 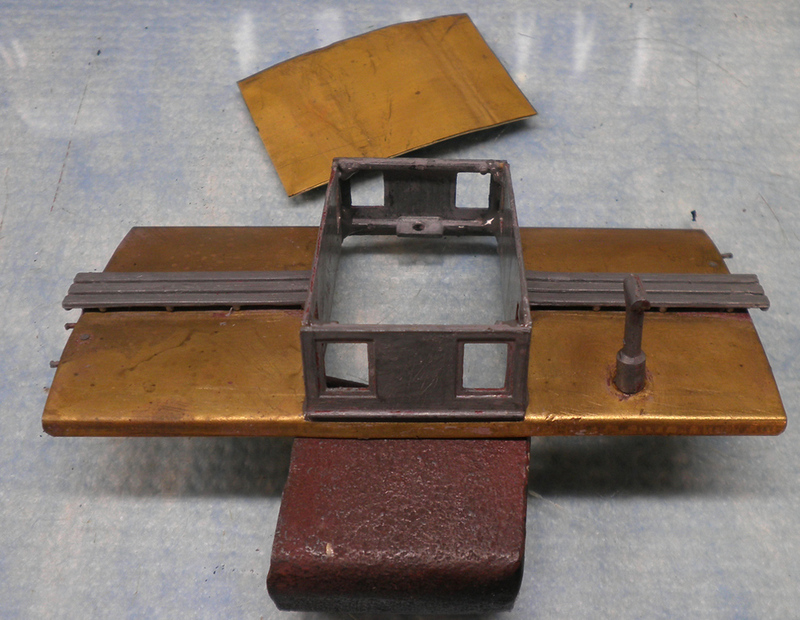 Straigthen up the smoke jack and then found a bit of .010 brass to make the roof for the cupola. Gravity - its not just a good idea, its the law! Looking good, Martin. 4 walls - simplicity itself. Yes, and no... The doors were actually intended to open and pivot but not on actual hinges and one pivot clasp on one door was gone. I decided that this was an unneeded feature and JB welded them into place and that tightened up the 4 walls a bit, too. 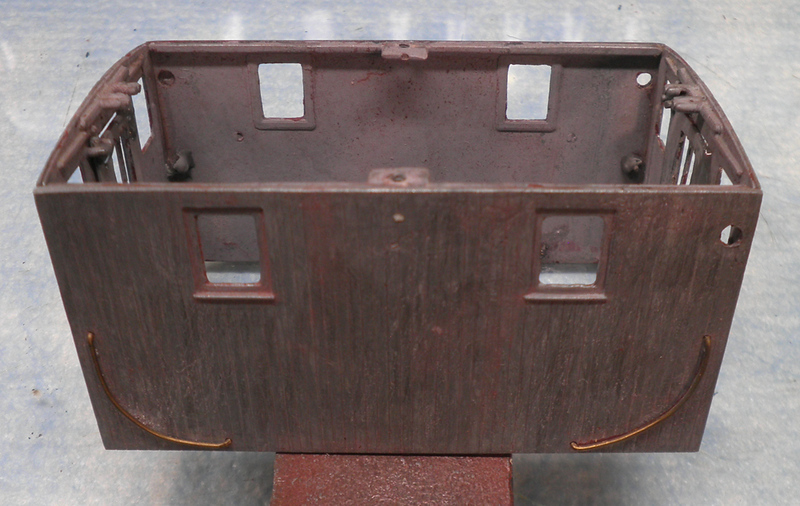 Took a file to all of the windows as well; castings were not all that clean. Need to grind through this and get it off my bench. Just got 2 Priority mail shoe box boxes and there's work to be done in those! Well, you made it look simple! What's in the shoe boxes? I know the feeling about grinding through and getting to the next. Just got my replacement soldering iron tips yesterday so now I can clear off my bench for the next project today! 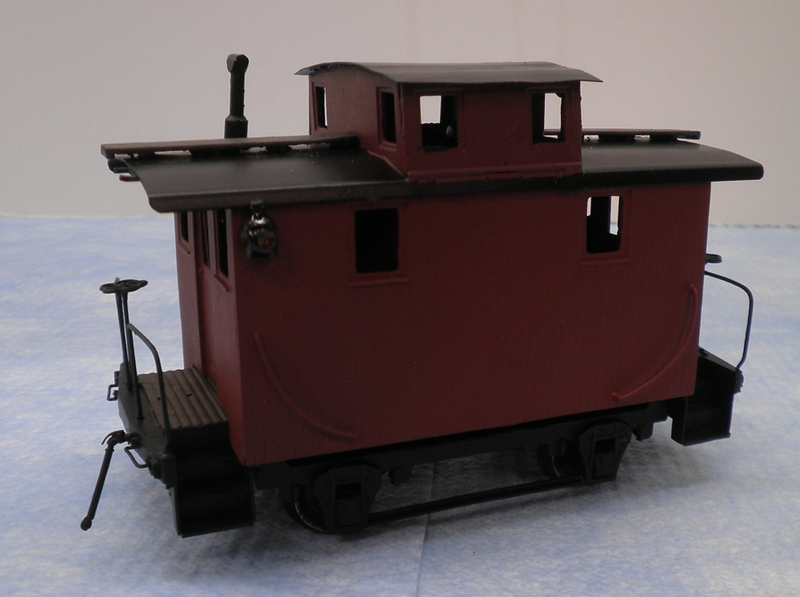 Funky NYC caboose that I want to make a copy of for fun; Pittman freight motor body w/o roof and floor, trucks, etc. Not sure what it will become when I get through with it! Been on a building frenzy; good bit of that does not get posted here since I need it as content for the magazine. Wrote one article this week and getting set up to write the next one over the weekend. When I'm not building or writing, I've been on a scenery burst on the layout. Just replaced one the lighting units in the ceiling today and my wife took one look at the change in light and told me to do the other 3. It's nice when SWMBO'd tells me to spend money! Are you using LEDs for your replacement lights? Fast forward to get this off my bench a bit....not quite 100% yet, but close. Nice look to your caboose. Sort of down home. Looking good, Martin. Particularly thinking about what you had to start with.